What’s the best car battery is a question I get asked a lot. So I thought it was about time to write a post on the topic. When it comes to batteries application must be considered first. Beyond just an automobile application, you should consider things like off road use, high or low temperatures, and short frequent trips vs. long highway commutes. When considering an off road application, batteries designed to resist vibration, shock loads, and be spill proof are features I would look for. In the world of off road or performance batteries, sealed batteries work well, because you don’t have to worry about battery acid spilling out. The type of battery that works exceptionally well at this is a GEL battery. With this battery even if the battery got damaged no fluid would leak out because the electrolyte is contained in a gel. Only draw back to these gel batteries is that they need a charger designed for gel batteries. But these chargers are readily available now. You can check the ones we reviewed here. These Gel batteries also hold up well under shock loads and vibrations. A top brand to consider is [easyazon_link asin=”B006QH552E” locale=”US” new_window=”default” nofollow=”default” tag=”carbattery0e-20″ add_to_cart=”default” cloaking=”default” localization=”default” popups=”default”]Optima[/easyazon_link]. 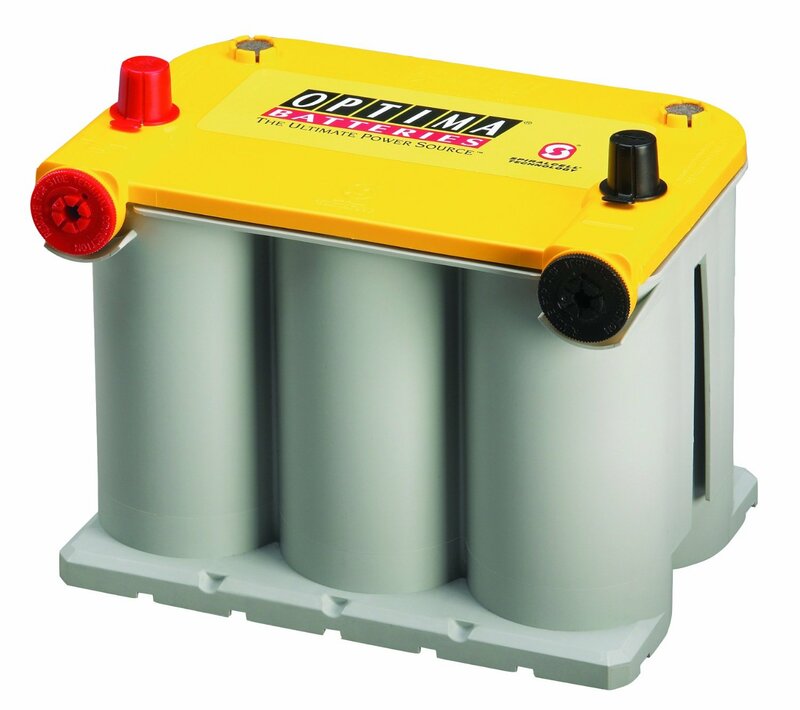 Optima batteries use a sperical lead plate design instead of a standard flat plate. This design increases the battery’s longevity. The main draw back to Optima is that they are a bit pricey. When you live in colder climates, terms like cold cranking amps ( CCA) and cranking amps (CA) become more important. Cold Cranking Amps is a rating that measures the power of the battery at 0 degrees F. , and Cranking Amps is a measurement at 32 degrees F.
In general the higher the rating the better the battery will perform in cold climates. In the opposite extreme, that is, a warm climate above 70 degrees F. battery maintenance may be an issue for you. Maintenance free and sealed batteries are designed to keep enough fluid in them and not loose too much because of evaporation to make it through the warranty period. If you are like me, I prefer a battery that I can maintain myself by adding distilled water and load testing the battery, charging it when needed. There are many brands that make good batteries so as a rule of thumb the highest CCA and CA you can afford is best. Consider maintenance free and sealed batteries if you just want to forget about the battery. Another consideration is how much extra load you will put on the battery through after market devices like inverters, winches, extra lights and amplifiers. all these items will shorten the life of your battery, if you do not check what the max output of the vehicles alternator is. If your extra devices exceed the alternator’s output in amps, then the battery takes over in supplying those amps. Meaning, at that point your battery may be discharging and not charging at all. Not fully charging lowers the batteries service life due to excessive sulfation. You can always get a charger with a desulfation mode like the ones we reviewed here, to help with battery longevity. You can also view after market alternators here. This is a consideration not many folks even consider at all. But short trips and frequent starting may cause your battery never to fully charge, because you haven’t driven for a long enough time. Undercharging will cause excessive sulfation shortening the batteries life span. If this is the norm for your vehicle you may want to consider a deep cycle battery as opposed to a starting battery. Deep cycle batteries have thicker plates and therefore have a greater reserve capacity. In either case keeping your battery on a good smart charger will prolong the battery’s life span. Price is always a consideration, especially for younger folks just starting out. The typical warranty periods for batteries is 3 to 5 years. Most batteries will make their warranty periods even with little or no maintenance. The thing to note here is that the price goes up with longer warranty periods. It is a known fact that keeping your battery not only fully charged, but charged in stages will increase the battery’s service life. Making a battery last twice as long as the warranty period is not uncommon, or unheard of. It is a way to get a five year battery at two year prices. You just need a little discipline to hook up the charger every night. Freshness counts! Check to see when the battery was manufactured. Don’t but anything over six months old. There is a date code engraved on the battery. The first character will be a letter and will indicate the month. A for January, B for February etc. The second character will be the year. 3 for 2013, 4 for 2014 etc. Check for full or prorated warranties. Most auto stores will charge a core charge for the old battery. Just bring the old battery back for a refund of the core charge. Batteries come in all sizes to fit different cars. Make sure you buy one that will fit your year, make and engine size. When replacing your vehicles battery consider your application first. If you are simply the average motorist, then buying the highest CCA and CA that money will allow is a good rule of thumb. If money is tight consider purchasing a float or smart charger to extend the life of a cheaper battery. If performance is your thing, consider Optima batteries. They have a good track record. I hope you found this information useful. Please don’t forget to “Like” and “Share”. Thanks!